There’s a terrific piece over on Paul Thurrott’s Supersite for Windows that posted yesterday, entitled “In Praise of the Windows 8 Desktop.” In that story, he calls out all the new features on the old-fashioned but still extremely usable desktop in Windows 8 that deliver new or vastly improved functionality. Those items are worth perusing and pondering, as they do provide some real and tangible reasons why business might consider permitting Windows 8 to find a spot on their users’ desktops. And FWIW, I mostly concur with his observations and analyses, and even add a special favorite item of my own. Aero and its resource-hungry “glass effects” have given way to a more spare, square, and opaque Window display on the desktop. Aero was banished because of its negative impact on battery life, which makes the new look also more battery friendly. 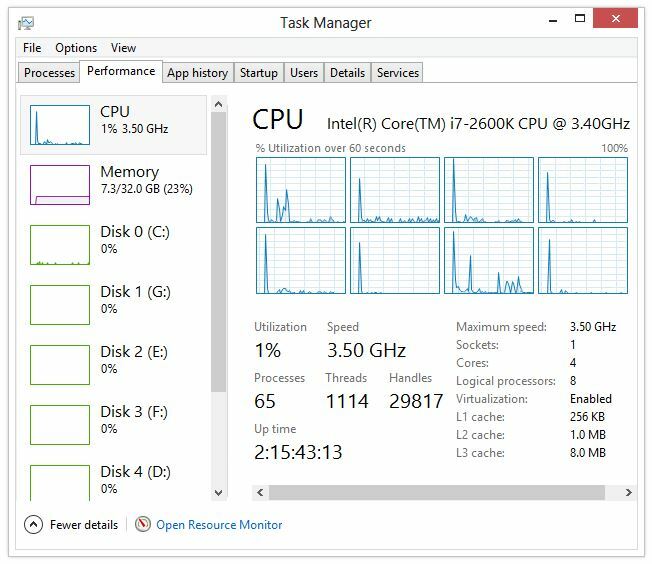 Task Manager gets a big increase in capability, including a vastly improved look (which Thurrott correctly attributes to Sysinternals’ excellent Process Explorer utility, the brainchild of Windows guru Mark Russinovich, who’s been a Microsoft Fellow for almost a decade now), the ability to manage startup items (no more msconfig.exe, yippee), services, app history, and more. Improved security thanks to a beefed-up Windows Defender and Smartscreen technology. Given recent reviews have found these free MS built-ins less secure than other free (and commercial) alternatives, I’m not sure I buy into this 100%. But I do confess to using Windows Defender on test systems and VMs because it installs by default and is at least adequate at keeping things secure. For power users, Thurrott points to Storage Spaces fast and simple support for JBOD and data redundancy without — as he puts it — “…a master’s degree in RAID required.” He also mentions BitLocker, BitLocker to Go, and improved support for multiple displays as boons to those who want to give Windows a real work-out. Finally, he calls on fast boot (and shutdown) times and the ability to reset a Windows install to factory reset conditions (he calls this “nuke from space”) as great improvements over earlier Windows versions, with reports of 6 second boot times and the ability to run a reset in 6-7 minutes. My times aren’t that fast — more on the order of 30-50 seconds — but mine are better than Windows 7 on the same systems across the board, too. The “Refresh your PC” capability is also great, but even better is the built-in recimg (record image) command that lets you capture a complete Windows install image after you’ve updated all the drivers and installed all of your favorite applications (especially desktop applications and installer-based device drivers) and use it as the source for the refresh operation. Slimware Utilities’ free RecImgManager tool makes this facility especially easy and convenient to use, too. Because Windows 8 supports the same hypervisor that Windows Server 2012 uses (Hyper-V Manager v3.0), using VMs in Windows 8 beats the pants off Virtual PC or Virtual Server in Windows 7: you get support for bigger virtual disks (VHDX format), faster VM load/unload times, more VMs, and lots more. I like Windows 8’s ability to use the Microsoft Live ID login for system access, and the ability to synchronize multiple Windows 8 user environments that share a common Live ID. I use this on multiple Windows 8 installations very gladly. Windows 8 adds improved support for the Universal Extensible Firmware Interface (UEFI) and provide the ability to secure the boot-up process before the OS is loaded. Though I’ve had occasional issues with this facility, it does provide better low-level diagnostics and troubleshooting for PCs, and will protect boot-up from malware and break-in attempts. I do see Thurrott’s point — that there are things about the Windows 8 desktop that users and admins will like — but I also get the backlash against the removal of the Start Menu from the base OS, and how little business users like being forced to boot into the Modern UI tile-based Start screen, rather than the old, familiar Windows desktop. Nevertheless, there are real, positive reasons to look further and deeper into Windows 8. Whether or not this leads to wider adoption still remains to be seen.